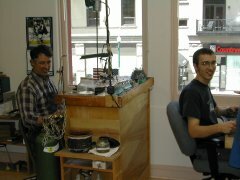 Family owned and operated for 20+ years, Jewelers Services is located in downtown Colorado Springs, Colorado. Our commitment is to provide fine quality jewelry and a variety of related services to all our clients in Colorado, and more recently to the world wide web. Designer Ted Blum has created hundreds of beautiful, custom design pieces, including platinum wedding sets, unique gold money clips, and specialty design sterling silver belt buckles. For years, Ted has been servicing private individuals and business alike, slowly building his reputation and growing his shop. At Jewelers Services, we specialize in custom design. We are equipped to help you turn all of your jewelry ideas into reality. Also, we offer a wide variety of services to keep your jewelry in good repair and looking it's best. Of course, polishing and check-ups are always free on custom pieces. All of our production and repair work is done in-house, at Jewelers Services we pride ourselves on being a full-service jewelry shop. As a family operation, we understand the importance of building relationships with our clients. We take extra care to ensure they are satisfied with our products as well as the quality of our work. Visit our Gallery for gift items! We also offer a limited line of handcrafted, sewn Gift items. Please email, write, call with any suggestions. We appreciate your visiting our website!